Based on true events, The Last King is set in civil war-ravaged Norway ,where a battle for the throne is being waged between the Norwegian King Håkon and the Church’s Bishopmen. Aided by rebel group the Birch Legs, the Norwegian King fights for survival against the Church’s Bishopsmen, who seek to supplant the throne. On his deathbed after falling ill, the King soon welcomes a son, born in secrecy, as half the Kingdom wants him dead. 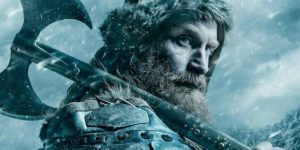 Tasked with guarding the only remaining heir to the throne, two Birch Legs warriors, Skjervald (Jakob Oftebro, The Snowman) and Torstein (Kristofer Hivju, TV’s Game of Thrones), escape with the infant and must traverse treacherous landscapes to protect their future King. Directed by Nils Gaup (Pathfinder) and presented in Norwegian with English subtitles, the epic action-adventure film received a limited release in theaters in June, 2016. Special features on The Last King discs include an interview with actor Kristofer Hivju and the music Bifröst, featuring scenes from the movie.